In January 1996, the American philanthropist, scientist, and heir to the Du Pont family fortune, John Eleuthère du Pont, shot and killed a man on his Pennsylvania estate. That man was Dave Schultz — an Olympic gold medalist in freestyle wrestling and the head of du Pont’s “Team Foxcatcher” wrestling team. After his arrest, du Pont pled “not guilty by reason of insanity” and was found guilty of murder in the third degree. He would die at a Pennsylvania correctional institute in 2010. Such are the bare, yet grim, facts of du Pont’s demise. But why did he kill Schultz? And how did this ornithologist and philatelist become intertwined with U.S.A. Wrestling, so much so that he housed a training facility on his property? Bennett Miller’s Foxcatcher aims to explore these questions, and it does so with muted tension and an almost palpable sense of dread — qualities that earned Miller “Best Director” honors at Cannes in 2014. 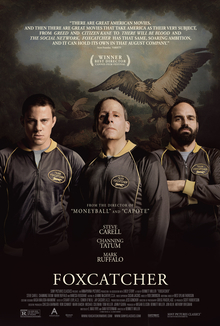 That Foxcatcher also bears political undertones, treating du Pont (Steve Carell, a long way from Brick Tamland and Michael Scott) as a symbol of American privilege and conceit, casts a wider light on its narrative. In trying to understand du Pont, Miller suggests, we may be to able to better understand why hard-working persons like Dave Schultz are “shot down” in their pursuit of the American dream. It is an ambitious premise, and Miller’s execution is admirable. Yet, I’m not sure that it ultimately works. For one thing, Miller is only able to guess at du Pont’s motivation, both with regard to Team Foxcatcher and with regard to his killing of Schultz. Perhaps it was a lonely upbringing, exacerbated by a demeaning mother? Perhaps it was suppressed sexual desire, particularly in relation to Schultz’s younger brother, Mark (Channing Tatum, in a breakout performance). Perhaps it was drug and alcohol addiction? Or perhaps it was the realization that, wealth aside, du Pont really never had anything — indeed, that money just can’t buy me love? Ironically, any of these reasons might lend themselves to theological exploration. After all, human fallenness and the concomitant frustration of desire are classic theological motifs, which have their roots in the very first chapters of the Bible (Gen 1-3). But Miller fails to delve into these topics, even in a philosophical mode. The socio-political symbolism — he relishes the fact that du Pont refers to himself as “Golden Eagle” — is just too inviting, too “important.” Even worse, such speculation may simply be beside the point. Further exploration of the du Pont case suggests that, while du Pont certainly was rich, he was also certainly mentally ill. Doubtless it is convenient to turn him into an archetype, but, in this case, there is a very real question about the suitability of such an approach. Du Pont was a fallen human being, compromised by the frailty of our condition. And there is a depth, a genuine sadness, in such a truth. But, alas, the stuff of political tragedy it is not.